My Stromberg-Carlson 520-PG (previous parts 1 2) is finally finished! The radio came out ahead of my expectations, even, and was delivered to its new home yesterday where I expect it will continue to serve for years to come. See these in-progress photos, or jump to the bottom for the “after” picture! The radio was fairly beat up when I found it – dirty, scratches, missing the speaker cloth, and completely original electrically. After assessing the condition of the coils and transformers, it was time to mount the chassis to the bench and start the real work. It plays beautifully on line input, and picked up distant AM and Shortwave broadcasts (including Radio Australia, a Russian CW and an Entertainment station, Japanese music, English-language religious programming, and a Cuban broadcast. Now, it’s on to the next project! 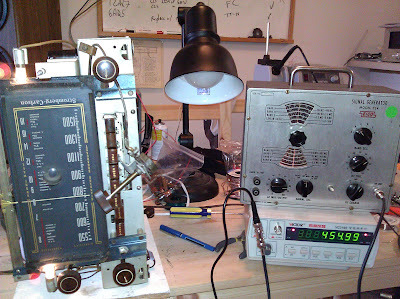 This entry was posted in Projects, Radios and Tubes, Vintage and tagged 520-pg, antique radio, cabinet, grill clothc, shortwave, stromberg-carlson. Bookmark the permalink. Thank you for posting this! I have the exact same model and I’ve searched for information on it for a long time now. You did a fantastic job with the refurbishing! Have you ever been able to gauge what this particular model could be worth?